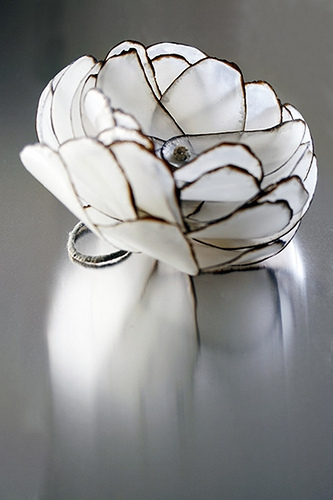 Jewelry designer Inni Pärnänen of Finland worked with unusual materials to make this lovely ring. Composed of burnt paper, candle wax, iron, and cotton thread, the dimensional flower is a striking art piece. She also uses traditional metals to create jewelry along with a few oddities... cow horns, for example! Visit her portfolio. This weekend is not only nice and long due to Memorial Day here in the U.S., but it's the kick-off to summer too, my very favorite time of year. Have a good one! This is a real beauty!! Her jewels are real work of art. What a marvellous piece of art jewellery!! I love the burnt edges of this ring and I enjoyed browsing Inni's gallery pics. Goodness me, aren't people clever?